Heat skillet or griddle over medium-high heat or to 375°F. Grease with vegetable oil or shortening. In medium bowl, stir pancake mix and water with fork or wire whisk until smooth (batter will be thin). Stir in mashed banana and 2 tablespoons walnuts. 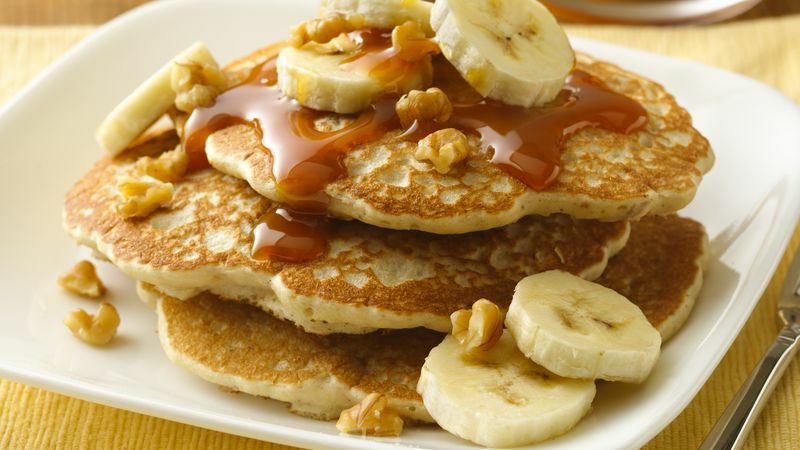 Serve pancakes topped with sliced banana, 2 teaspoons walnuts and the caramel topping. For added flavor, toast walnuts on ungreased hot griddle for 4 to 5 minutes, stirring frequently. Set up a self-service pancake bar with an array of toppings like low-fat fudge topping, whipped topping and fresh fruits.